9. 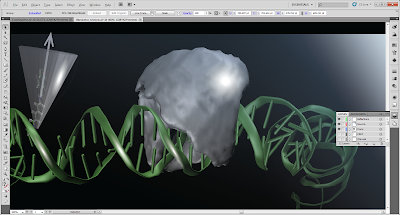 Add light source and surface reflections in Adobe Illustrator - The fluorescence laboratory. 1. In the Layers panel, add a new layer called Source and hide all other layers but the background. 2. Select the 'Rectangle Tool' from the left menu at create a rectangle in the source layer which covers the figure. 3. Go to the Grading panel to the right and select gradient fill 'Fade to black'. Set the angle to 15 degrees. Move the left Gradient Slider to the far right and the right Gradient Slider slightly to the left. Set the color of the outer right Gradient Slider to white. 5. Now add some reflections to some of the surfaces facing towards the light source. First add a layer called Reflections. 6. From the Glare layer, copy one of the blended inner dye glares created in tutorial step 5 into the reflections layer. 7. Resize and orient the glare to fit the surfaces at the desired positions. Below is shown a reflection created in this mannuer on the AV. 8. Copy paste the reflection into the Reflection layer again and resize and position it similarly to step 7. This time at the cone surface. 9. Repeat step 7 and 8 to have 8 new reflections in total.